Are you also constantly writing SMS and mails whenever and wherever you are? 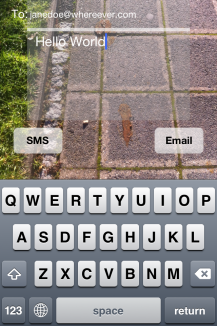 So that your way doesn’t disappear from view while typing and walking, we now have the SMS while Walking app.Normally you can only see the text on your display while typing and you stumble blindly all over the place. Now this will finally come to an end! No more running into passersby, no more lampposts that give you a headache because you once again walked into them and no more uncontrolled obstacle course around traffic signs, cars or bicycling fellow citizens. With the app you can look directly through your mobile phone and still keep your surrounding in focus. And therefore there will be nothing left in the way for typing.